In its first production year, the GTX DI won both PWI magazines' “Deluxe 3-Seater Shootout” and Watercraft Worlds' “Deluxe Cruiser Shootout” awards!So, obviously, we did something right. A technological marvel praised by the NTSB (National Transportation Safety Board). Never willing to leave well enough alone, in 2002 we gave it a new hull and fine-tuned the Orbital Direct Injection, which improved fuel efficiency by 37% (ICOMIA duty cycle) and reduced exhaust emissions by up to 75% (Over EPA baseline). Take into consideration its 1000 series Rotax marine engine, class-leading 52.6 US gallon storage capacity, exclusive O.P.A.S™. (Off-Power Assisted Steering) system, Sea-Doo Learning Key™ and distinctive three-up contoured seating and it’s easy to see why the GTX DI is such a popular choice. The R.A.V.E.™ exhaust system allows the 1000 series Rotax® Powerplant to optimize it's potential in both low-end torque and maximum RPMs. Sea-Doo continually sets the trend in the marine industry with striking, eye catching colors that set the Sea-Doo brand apart from not only marine products but also all consumer products. 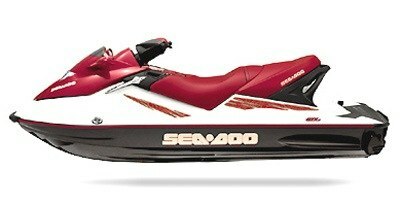 See the future in colors now, in the 2003 Sea-Doo watercraft line.